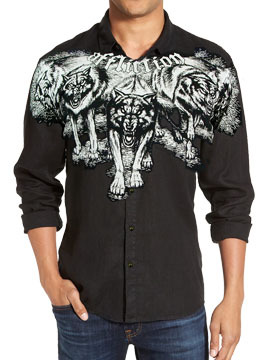 Affliction Wolves mens long sleeve button up dress shirt features the Affliction logo with a pack of five snarling and growling wolves on the chest. Silver fleur-de-lis buttons. The back is solid in color. 100% cotton, light weight, vintage slim fit. Garment dyed with silicon wash for soft feel. Color: black lava wash. .